The flag was adopted in 1967. The three stars in the centre of the flag officially refer to the three words in the national motto, “Unité, Travail, Progrès” (French for “Unity, Work, Progress”). The three stars are also said to represent the three ethnic groups who live in Burundi, the Hutu, Tutsi and the Twa. Burundi has a similar ethnic mix to Rwanda and has similar political and ethnic problems. The Twa are a pigmy race. The red in the flag stands for the independence struggle, the green for hope and the white for peace. Whitney Smith (1980) also suggests the possibility of the Burundian flag being based on the former Sabena airline flag, but he also says that there is no proof of that. According to Flags and Arms across the World by Whitney Smith (1980) civilians have the right to display this flag on holidays only. Otherwise the flag is used as a state flag and a military flag on land while the President of the Republic has right to use a flag on buildings. - diameter of the circle around each of the stars: 1/8 of hoist. Construction sheets for the Burundi flag can be found here. One should note that the shade of green in the flag of Burundi is considerably lighter than those in the flags of Burkina Faso and Bulgaria (as shown in Album 2000). For Burundi : PMS 186 red and 361 green. The vertical version is simply the flag turned through 90 degrees clockwise. The official construction sheet for the current flag is provided here. Le drapeau du Burundi est tricolore : vert, blanc et rouge. Il a la forme d'un rectangle partagé par un sautoir, comportant en son centre un disque blanc frappé de trois étoiles rouges à six branches qui forment un triangle équilatéral fictif inscrit dans un cercle fictif ayant le même centre que le disque et dont la base est parallèle à la longueur du drapeau. La loi précise les dimensions et les autres détails du drapeau. Article 8. La Devise du Burundi est : Unité, Travail, Progrès. L'emblème de la République est un écu frappé de la tête du lion ainsi que de trois lances, le tout entouré de la devise nationale. L'hymne national est Burundi Bwacu. Le sceau de la République est déterminé par la loi. Article 9. The emblem of the Republic is a shield charged with the lion head and three spears, the whole being surrounded by the national motto. 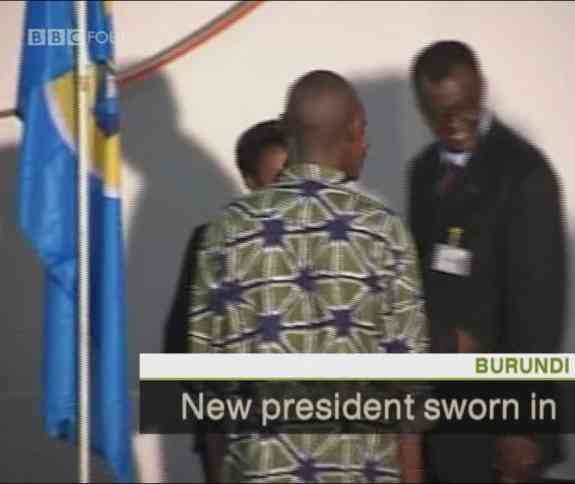 National anthem is Burundi Bwacu. The seal of the Republic is fixed by law. La langue nationale est le Kirundi. Les langues officielles sont le Kirundi et les autres langues déterminées par la loi. Article 10. The national language is Kirundi. The official languages are Kirundi and the other languages fixed by the law [as far as I am aware, it is only French]. Unlike the initial information that this would be the flag of the political party called Unité, this is the flag of the National Unity and is a recognized national flag, agreed together by all the ethnic groups in the country to be used alongside the national flag. I believe that there never was a party called UNITY but only a flag called "drapeau de l'unité". Unité is an institutional agreement (pact) between the three ethnic groups created from initiative of the then President Buyoya prior to 1993. Following this agreement free elections were organised and the first Hutu president (from FRODEBU) was elected. That this is indeed a recognized national flag and not a political flag (in the sense of being the flag of a political party) is confirmed by a Chinese news agency report which includes the sentence: "The new president received in turn from his predecessor the constitution, the national flag, the unity charter, the national unity flag, the national logo and the "intahe" (in Kirundi) - a stick that is the symbol of power and fair judgment" [my emphasis]. While the three stars in the national flag are said to refer to the three words of the national motto, they are also said to represent the three ethnic groups who live in Burundi: the Hutu, Tutsi and the Twa. According to news given by Grands-Lacs Confidentiel on 14 February 2005, the Government of Burundi is contemplating the removal of the three stars from the national flag. It seems that the stars are used by Tutsi extremists to back up their claim that the Tutsis are descendants of ancient Jews. They link the Tutsi to the Kushi and the ancient Kushit state ruled by the Queen of Saba; the Tutsi Judaism would pre-Talmudic, like the Judaism of the Patriarchs and Kings David and Solomon. The Centre de Havilla (Havilla means Great Lakes), founded in Brussels by Professor Jochanan (Jean) Bwejeri, is actively defending this theory, and campaigns against the removal of the stars on the flag. Grands-Lacs Confidentiel also reports that Israel, the United States and Britain put pressure on the government of Burundi to maintain the stars on the flag. An "explanation" of the Jewish origin of the Tutsis, by Mathias Niyonzima (in French) http://www.sefarad.org/publication/lm/056/html/page29.html. Note: This information is linked to the political struggle between the Tutsis and the Hutus in Burundi and Rwanda. The reliability of the sources quoted has not been assessed. Ed.